I had mentioned in my previous post that you can’t really go wrong when cooking anything with kimchi, say, noodles, rice, dumplings, etc. Here is another very popular kimchi-based dish that is relished by many Koreans and kimchi lovers. 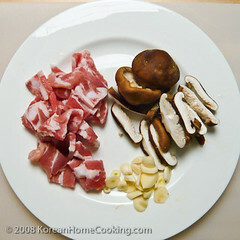 Cut bacon bite-size and slice mushrooms and garlic. 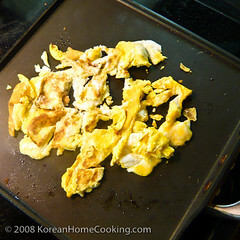 Scramble an egg and set it aside. 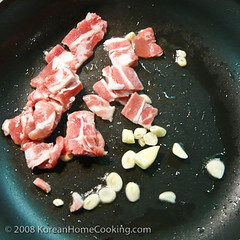 Glaze a frying pan with oil and stir-fry bacon and garlic together. 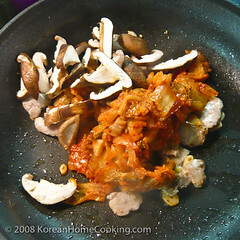 Add kimchi and mushroom shortly after. Once rice is mixed in, add sesame oil and some salt. Mix in the scrambled egg from Step 3 and add a dash of sesame seeds before serving. This looks so good! 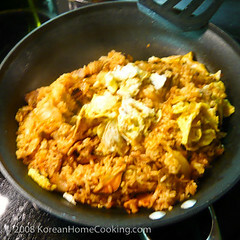 I love kimchi fried rice but it can be a bit difficult ot measure how much kimchi to add because depending on the brand/homemade, it can vary in saltiness. 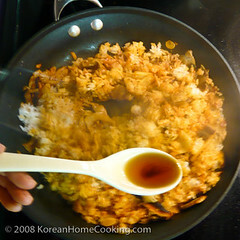 I'm also thinking of making a fried-rice style bibimbap (ie using the same ingredients) because I don't have the sizzling pot required for dolsot bibimbap. Making bibimbap like fried-rice so that it becomes more like dolsot bibimbap is such a good idea! I think I'll give a try, too. My name is Eun and I am a student living in NYC. 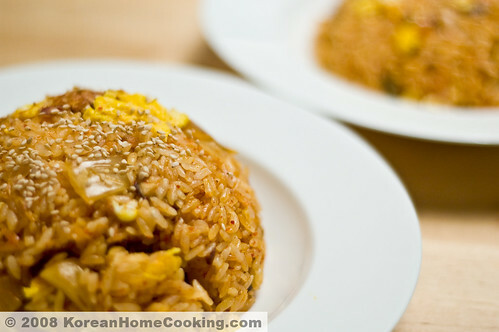 By chance I stumbled upon your website and being a fan of Korean cooking tried your kimchi fried rice recipe because it looked easy. And it is! I am amazed by the recipe because my culinary skills is horrible and yet the rice came out so good. =D Thank you for the recipe, hope you are still updating, and may I request the recipe for bibimbap and also dumpling soup with rice cake? Thank you! Can the sesame oil be optional or is it essential to the recipe? Thanks for sharing all these recipes! 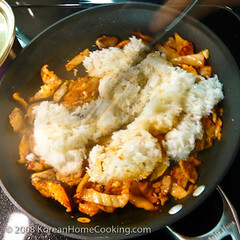 I'm starting my korean cooking experiment and your blog is my number one place for recipes.